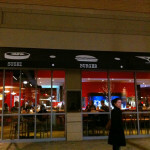 Note: When we reviewed this restaurant it was known as Big Daddy’s Burger Bar. They later changed their name to Bad Daddy’s Burger Bar due to legal reasons. You can find more information about the name change here. 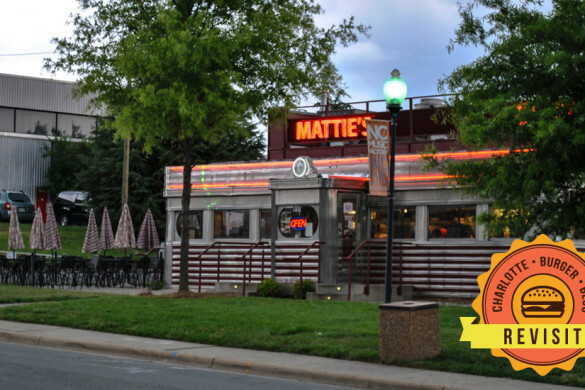 Hereford: Earlier, we wrote of the disturbing trend of restaurants announcing for themselves that they have the “Best Burger in Charlotte.” If you Google that phrase the first site listed is for Big Daddy’s Burger Bar. I can’t find any instance of Big Daddy’s making that claim themselves, but somebody obviously thinks it’s true. In order to test if that somebody is correct, last Sunday Angus and I braved the cold and took the 485 loop around to the Johnston Rd exit to visit Big Daddy’s. Angus: I kind of think their name is misleading. They call themselves “Big Daddy’s Burger Bar,” and the way that it is worded you might think that they have a bar of burgers—a buffet. The indication is that you could go down the line choosing your toppings and bread and everything else that you want on it. I actually think that sounds like it would be pretty good. However, that’s not what Big Daddy’s is. They should rename the place “Big Daddy’s Burgers and Bar,” because that’s what it is: A bar with burgers. But, you know, they never solicit my input. Hereford: The Big Daddy’s we visited is located at Ballantyne Commons East, another pre-planned residential/commercial space. 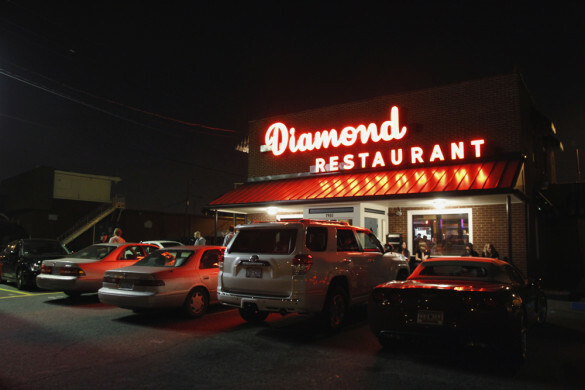 They have another location, the original location, in the Dilworth area on East Blvd. Big Daddy’s is a part of a larger restaurant group that also owns Cantina 1511, Mama Ricotta’s, and the Perfect Plate. I’ve not eaten at any of the other establishments, so I don’t know what other qualities that they might share. Angus: It was packed when we arrived at the restaurant. It was in the middle of the 4th quarter of the Panthers game (which they were, again, losing). The place was filled with families watching the game, which was on every one of the dozen or so screens that were in view. As it was so full, we were worried it might be a while before we could get a seat. But, we were told it would only be a 15 minute wait, and actually it was much shorter than that before we sat. The dining area of Big Daddy’s is one large room. It has tables in the middle and booths lining the walls. They have high ceilings with an exposed structure, and overall have a warehouse theme, except for the bar which looks more like a barn. It was all very clean, but not very warm in a social sense. Hereford: There were not a lot of decorations on the wall, but they did have some albums—Jackson Brown, the Rolling Stones, and a lot of Beatles stuff—and they had a bunch of license plates. I don’t get the point of the license plates—I couldn’t determine any significance from the numbers or locations. They seemed like they just needed something to throw on the wall so it wouldn’t be bare. Angus: When we got our menu the first place I turned, even before I looked at the burgers, was the beer menu. I have to say, Big Daddy’s has some great beer options. First and foremost, they carry Mickey’s. Mickey’s is my favorite beer. If I go to a place and they have Mickey’s, it has to be the first beer that I get. It’s a tradition I’ve had since I was 14. Hereford: Beyond Angus’s beloved Mickey’s, we were very impressed with the beer selection overall. They had over 20 beers, and we were impressed with the selections. They had some great NC selections such as Highland Gaelic and the hometown favorite, Old Mecklenburg. They also had Fat tire, Dogfish Head, and Bell’s—all great beers. One thing that we were really impressed with was that they listed where each beer was from on the menu. We like that because if you are unfamiliar with a beer, it tells you a little bit about it. Angus: In addition to all those beers, they have a “Big Daddy’s Brew,” which is a house beer brewed by the Carolina Brewing Company (which I ordered for myself) and a “Neighborhood Draft,” which is a rotating selection of special beers. Hereford: I ordered the Neighborhood Draft. It was a very good toasted lager, but unfortunately I never did figure out who it was made by. Angus: Unfortunately, my “Big Daddy’s Brew” was more like a Miller Lite, but it was relatively cheap and there’ll be a lot of people who like that. Speaking of cheap, another thing I liked was the specials. 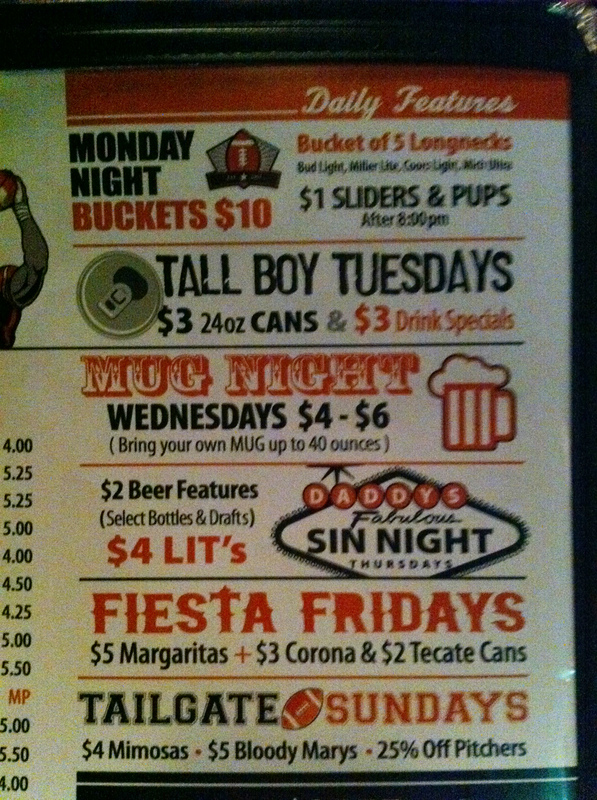 Big Daddy’s has some very impressive specials every night of the week. On the night we were there they had 25% off pitchers, which is a great deal. On other nights they have a “Kill the Keg” special. They buy a keg and you pay $1 for each cup full. You would think with that they would only get crappy beer, but our server told us they have great (and sometimes local) beer in the kegs during those nights. That is pretty awesome. Hereford: After geeking out about the specials and the beer, we turned to look at the burgers. 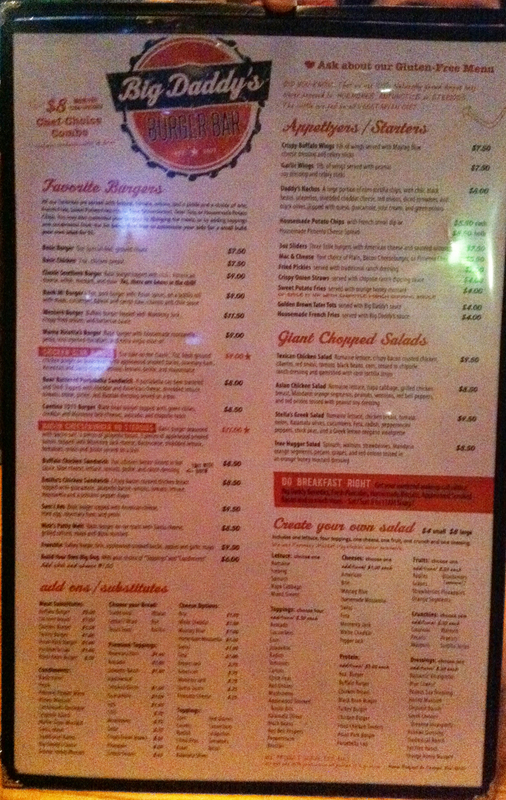 Again, just like at some of the other restaurants we’ve visited lately, Big Daddy’s has a lot of options for those who want to build their own burgers. Just like The Cowfish, Big Daddy’s has some interesting options—kalamata olives, orange honey mustard, & guacamole among more regular options. They have 10 types of cheese and 6 types of breads. They have something for just about everyone. So, that’s all great, especially if you’re terrified of Mad Cow disease. 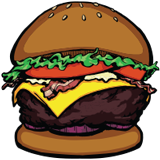 Angus: I’ve decided to change my assignment slightly here at the Charlotte Burger Blog. Originally, I was going to focus on double cheeseburgers. But now, I think I’m going to focus on bacon cheeseburgers. The primary reason for this change is that I like bacon. The secondary reason is that it gives me more to write about. Big Daddy’s certainly had planned for those of us who love bacon. On the menu is a “Bacon Cheeseburger on Steroids.” It is described as, “Basic burger, seasoned with bacon salt, 3 pieces of jalapeño bacon, 3 pieces of applewood smoked bacon, topped with Monterey Jack cheese, and Baconnaise, served on a bun.” Bacon appears 4 times in the description! Holy crap, that’s a lot of bacon. Hereford: On the way to the restaurant I was talking with one of our friends who had eaten at Big Daddy’s before. He said that when I asked the server what their best specialty burger is, what burger really sets them apart from everyone else, that I will probably be offered the “Sam I Am” burger. 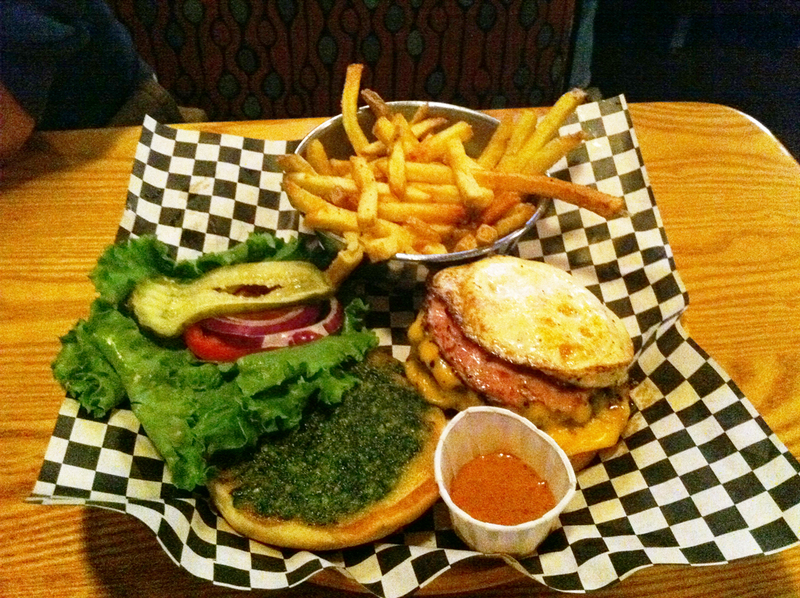 The “Sam I Am” burger is a take off of the Dr. Seuss story, Green Eggs & Ham. It has ham, eggs, and pesto (for the green). That might be a problem. I have a taste aversion to runny eggs. They make me sick. I didn’t really want to go into this story here, but I feel that I must in order to adequately explain myself. Once when I was in high school I was visiting a girl that I liked to have breakfast with her family. Prior to this breakfast her father had constantly made remarks about how little I ate in front of them. That was really because of my nervousness more than anything else, but I couldn’t say that. So I decided after his last comment that I was going to eat whatever he put in front of me. If he was going to ask if I wanted more, I was going to say yes. I was going to prove a point. So he made eggs for us. He scrambled them, but they were runny. And I filled myself up. I cleaned off the plate. As I was working on my seconds I noticed that my stomach was unsettled. I tried to ignore. I though that if I just kept eating it would be alright. That didn’t turn out to be the case. Suddenly my stomach rejected the runny eggs that I had been gulping down and sent them up my throat. Now, I liked this girl. I didn’t really want to throw up on her table. So I caught my vomit—in my mouth. I ran upstairs as it sloshed across my tongue and spit it out. It was an awful experience—physically and socially. Incidentally, she stopped calling me. Hereford: Yeah, I don’t like runny eggs. But, the point of this blog is to try new things. The point of this blog is to find the differences in a very limited category. We rate a specific food found in a specific city. If I try to further limit my options by not eating what the restaurant places in front of me and keeping an open mind about it, I thought I would be doing a disservice. And besides, that was over ten years ago. Maybe I would think about it differently now. So, Angus and I explained why we were at the restaurant and our overall concept. And I asked her to pick out a specialty burger—something that was unique to this restaurant that they do better than anyone else. And she says the “Sam I Am” burger. Angus: Now, I want to point out that I told Hereford that he just ask for the egg over-hard. I don’t like runny eggs either, so that’s what I often order at restaurants. I didn’t think he should place himself in a situation where he would hate something and not eat it. Myself, I don’t really like vegetables and I always have the tomatoes and onions removed from my burgers. Hereford: Well, I see our jobs as essentially different here. He rates the same thing—allowing each restaurant to be on an equal footing. I rate what they do differently. The person who designed this menu felt that it would be better to have this egg runny. If that’s what he thought, I wanted to try it. I would say that I feel I owe it to the readers, but I don’t think that we have any. Instead, I’ll say that I feel I owe it to the concept. Our blog is about one specific food in one specific city, and I want to be able to focus on the differences I can find within that limitation. And, after just over 21 minutes our food came out and I got the chance to see how far my stomach would allow me to go. Angus: So, this I believe was the most expensive hamburger that we’ve had yet. I was hoping that it would be worth the cost. You can see that it came in a handy wrapper so that you don’t wind up with baconnaise on the front of your shirt. I think that was a nice touch, and I certainly appreciated it. Overall, I liked my burger. I could tell a difference in the two different types of bacon. The jalapeño bacon was not really spicy, and was kind of tough. The smoked bacon was more floppy. I couldn’t really taste the burger—I don’t think that it had a lot of flavor. I could really only taste the bacon. Maybe that was because of the baconnaise, which honestly there was too much off. I felt like this was obviously a gimmick sandwich, and was a bit overpriced. But I would certainly eat it again. Also, I think I had a heart attack. And, apparently, a whole hell of a lot of lettuce. 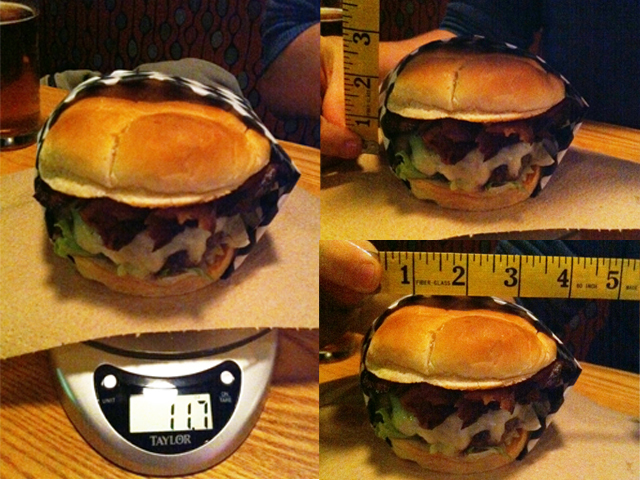 Take a look at that picture—I could have wrapped the lettuce around the burger twice. What am I supposed to do with that? Fold it up like a map? And it’s not even crunchy lettuce—it’s that dark garnish lettuce that has no flavor and takes too much chewing. 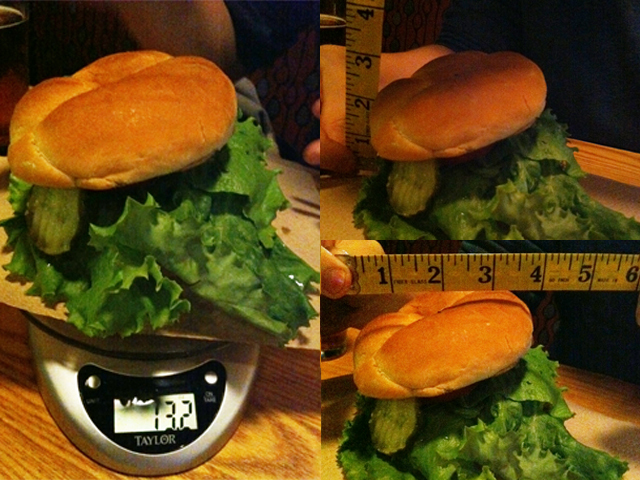 But, that wasn’t what I was thinking about when I took the burger off the scale. I was thinking about the egg. I paused for a moment and tried to prepare myself. Then I took my first bite. The good news was that it wasn’t that runny. The bad news is that it didn’t have to be very runny at all for me to wretch. It was awful how sick that it made me feel. I slid the egg off of the burger and took some deep breaths as I stared at the floor. I wanted to eat the whole thing. I really did. But I just couldn’t. After I took a moment I felt better and ate the rest of the sandwich. Unfortunately, while it didn’t make me want to throw up, I didn’t much like it either. It wasn’t all bad—the tomato and the pickle were good. The tomato was fresh and the pickle was a sliced long spear, so you got a lot of pickle in each bite. The ham was good and flavorful—and an interesting addition to a burger. 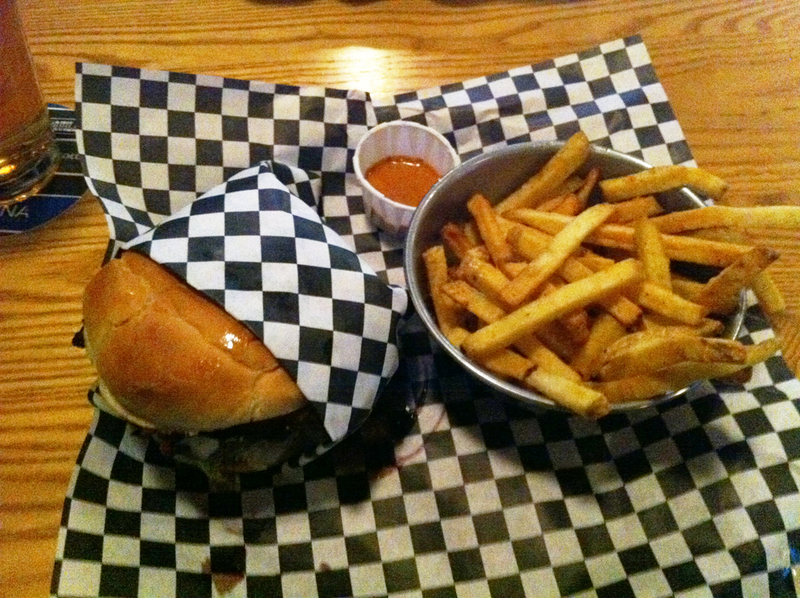 The pesto was good at first and gave the burger an interesting flavor. But, as I kept eating, it seemed the flavor got stronger and stronger. As the green seeped through the bun it started to over-power the rest of the burger. I felt the American cheese was boring. And the lettuce proved to be super annoying. Because of its size it kept pulling all of the good stuff off the burger as it tried to slide out. I really cannot comprehend anyone liking lettuce like that. So, I have to say that I thought it was bad. I do not ever again want green eggs and ham on my burger. I would not eat them on a….on second thought, I don’t want to write that. I don’t want to be that guy. I want to say that the egg fiasco didn’t influence how I felt about the rest of the burger. I truly feel that it didn’t—I don’ think that I would have liked it anyone. But, I have to allow for the fact that it is possible. I’m not sure if we can ever be sure about those things ourselves. Angus: As a last thought before the ratings, I’d like to say that the fries were top-notch. They were crispy and not greasy. And, they came with a big daddy’s sauce that was a type of spicy mayonnaise that I couldn’t get enough of. Hereford: Agreed. If I had to say anything bad about it, it would be that they were a little stingy with it. It came in a little swishy cup, and they didn’t even fill it up enough that you could swish with. 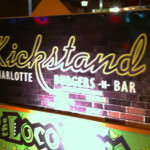 Food: 2.5— Well, so much for this place having the “Best Burger in Charlotte.” We really struggled with this rating. Angus liked his burger, but didn’t think it was stellar. The fries were good. But Hereford really hated his. Angus tried it, and agreed that it was not good. 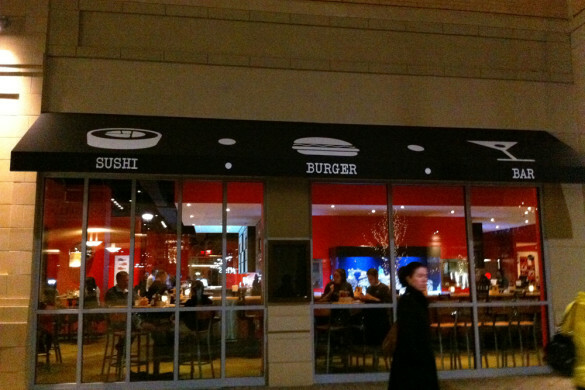 We felt that, if three is average, that burger brought the restaurant a notch below average. Service: 4— Our server as great. The place was slammed when we came in, but she was very attentive. This rating would have been higher, but Angus dropped by the bar before he was seated to pick up his Mickey’s and the bartender blew him off. There’s nothing we like less than standing at the bar, with money in our hands, waiting for a bartender to stop talking and serve us. Theme: 2— Big Daddy’s only has a minimal theme. They kind of look like a warehouse, but kind of look like a barn. They have a lot of music on the wall, and also some license plates. We’re not really sure what it’s supposed to add up to. This would have been lower, but the music they did have was good, and I think that counts for something. Atmosphere: 3.5— This place definitely seemed like a sports bar. If you like to go out and watch sports, then this rating will be higher for you. If you don’t, this place will lose some of its appeal. Beer Selection: 4— This was the most impressive thing about Big Daddy’s. They had good beer, they presented it well, and they had a ton of killer specials. Of the places we’ve rated so far, they’ve done it the best.